“Think like a human” is Google’s new motto, and it’s going to get very personal. Google’s new Knowledge Graph will be rolled today, Wednesday, and it will take us to the point where we search the giant search engine. Just like a human, Google seeks to connect and fully comprehend each searched topic. Using its own sources and collaborating with third parties such as Wikipedia, the Knowledge Graph supplies users with a ready list of quick facts on the subject, as well as a list of categories and topics associated with the initial search. 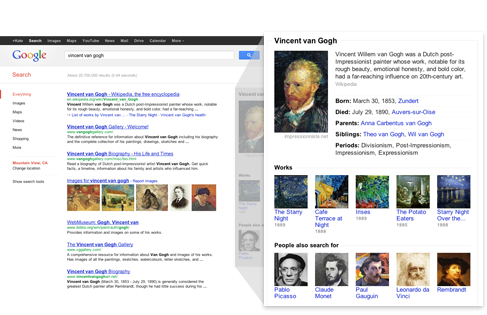 Google’s Inside Search directs first-time users to an example using the artist Vincent van Gogh,while relevant links continue to be offered as usual. The Knowledge Graph, displayed on the right-hand side, provides the subject’s “at a glance” facts. Not only is his significance, birth, death, and family listed neatly, Google also includes van Gogh’s most famous works, related figures, and even offers to search them for the user. The Knowledge Graph works to provide quick answers while simultaneously branching out to a wider, yet still relevant–and arguably equally important–range of topics.